Update: Metz (2013) came to the same conclusion of Bernstein (2012). Metz concluded, “Less than one third of the good candidates for TOLAC [trial of labor after cesarean] chose TOLAC. Managing provider influences this decision.” Read more here. The findings of “Trial of labor after previous cesarean section versus repeat cesarean section: are patients making an informed decision?” presented at the February 9, 2012 annual meeting of the Society for Maternal-Fetal Medicine’s, The Pregnancy Meeting ™, in Dallas, Texas is not surprising. Doctors have so much influence over patients and apparently, patients are making medical decisions without a basic understanding of the benefits and risks of their options. The study was a survey provided to women upon admission for their elective repeat cesarean section (ERCS) or trial of labor after cesarean section (TOLAC). I am really shocked at the level of knowledge most of the women had. 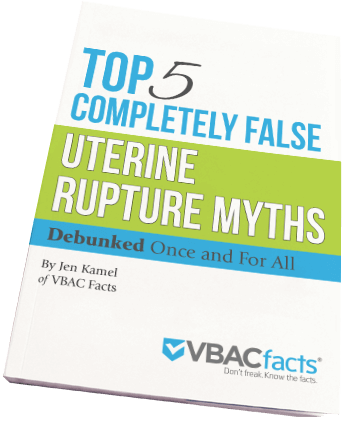 73% of the women admitted for a ERCS did not know the chances of a successful VBAC and 64% did not know the risk of uterine rupture. 54% of women choosing a TOLAC did not know the chances of a successful VBAC and 45% did not know the risk of rupture! WOW!! Women in both groups demonstrated lack of knowledge on the risks and benefits of TOLAC and ERCS, particularly women in the ERCS group. Specifically, patients were not familiar with the chances of a successful TOLAC, the effect of indication for previous CS on success, the risk of uterine rupture, and the increase in risk with each successive CS. Only 13% of TOLAC patients and 4% of ERCS patients knew the chances for a successful TOLAC, while the majority in both groups stated that they “did not know”. The majority (64%)of ERCS patients did not know the risk of uterine rupture during TOLAC and 52% did not know which delivery mode had a faster recovery time. This is why, even if you are on the fence about VBAC vs. repeat cesarean, selecting a care provider who is genuinely supportive of VBAC gives you the power of choice. Read more on what makes a supportive care provider here. Read the press release and a news article. Quickly and easily provide the resources for VBAC information with the FAQ card. My name is victor my wife having a problem for pregnancy I go meaning peace looking for help I don’t see help, until see this men sabon sprit doctor he now have the solution on the problem that I face, for over 4year to 10year my wife she is pregnancy drsabon now give me mercy for that, over one month my wife she now pregnant me and family happy, today I have a baby boy now person that need help he or she contact me gmail.com drsabonspelltmple thank you. I’m so sorry, I don’t understand your question. Could you ask it again? My doctor is on the fence although I sense an anti-VBAC attitude (little does he know I am getting midwife care for the last 4 weeks and driving 8 hours to have TOLAC). I am awfully and easily swayed in labour and I CANNOT handle any possible pressure from him.